That’s the title of the book I recently finished reading. 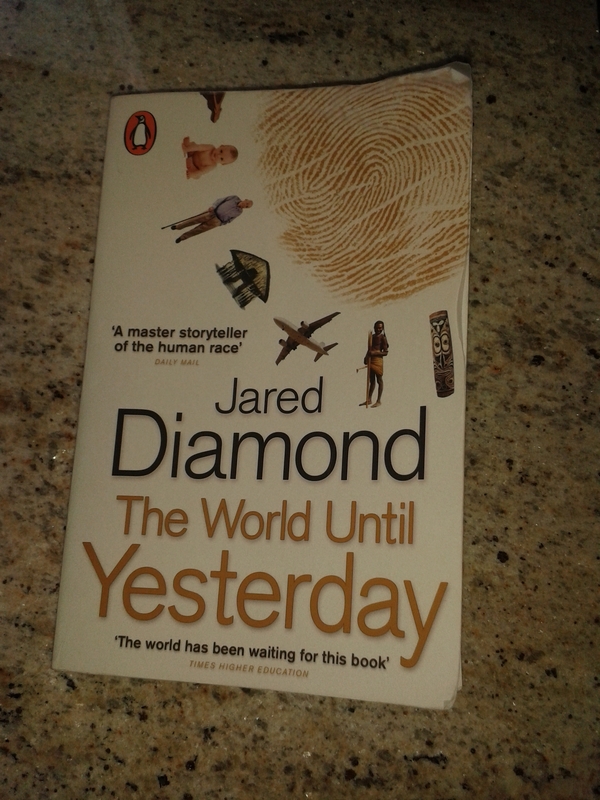 You may recognise it – it’s the latest offering from Jared Diamond. His basic premise is that traditional societies, still living today as our ancestors did many thousands of years ago, have much to teach us in how to deal with essential human problems, such as how to deal with conflict resolution and look after children and the elderly. As expected, it was a very insightful and stimulating read. However, there are three areas where it seemed to me as though the author was missing a trick. The first is the concern about the treatment of the elderly in our modern societies. I would not wish to deny that this is indeed a very valid issue, but it needs to be tempered with a recognition that the situation for younger generations now is also something we need to worry about as a society. I am thinking about the high levels of youth unemployment found across many European countries, which has led some to talk of a lost generation . It’s a very different kind problem and I doubt whether there is template for a solution to be found amongst the Tsembaga Maring society of New Society or their equivalents. The second point is that Diamond could have made more of another important way in which traditional societies appear to be healthier than modern ones – namely, in the area of mental health. This isn’t mentioned beyond a discussion of the benefits of multilingualism in possibly helping to delay the onset of Alzheimer’s. Perhaps it could be argued that there is an unspoken assumption that those living in traditional societies are emotionally secure and self-reliant. However, given that mental illness is getting more recognition today , I would be interested to get Diamond’s thoughts on why depression and anxiety don’t figure in the tribal societies he surveys. Finally, I want to bring up food. Diamond does have a chapter on ‘Salt, Sugar, Fat and Sloth’, but this talks about the ill effects of modern diets. What would be interesting to pick up on is how traditional diets have something good to offer as well as the absence of negatives. Who hasn’t heard of the Paleo diet or the 5:2 eating routine? Regardless of whether all the hype around these new diet fads is actually valid, it would be good to add these ideas to the list of pluses for traditional societies. And as well as the eating style, what foods are actually consumed is noteworthy. There is growing interest in learning from indigenous diets : they can contain nutritionally important foods (quinoa, anyone? ), as well show us how to eat well with greater sensitivity to the long term sustainability of the local ecosystem. This is very different to modern industrial farming. Putting the above points aside, I have one final comment to make: the book is fascinating, it has made me question many aspects of modern life, but, even so, in no way would I be ready to step into a time machine to swap what I have now for something more traditional. Anyway, I should be going forwards – I do try to claim expertise in futures after all!